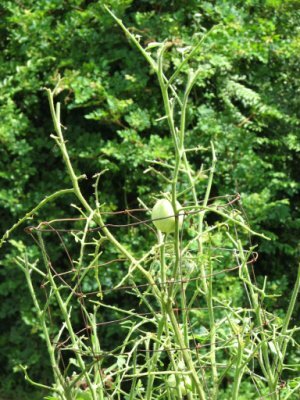 I’ve been noticing some severe damage on my tomato plants and decided to investigate. I thought it looked like caterpillars and starting hunting around on the bush for them. They were caterpillars alright – big, nasty, green ones! 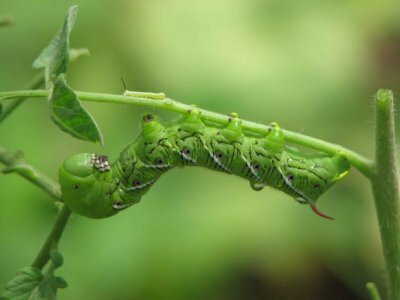 I looked them up on the internet and it said they were tobacco hornworms – named so for the little horn on their hind end. Here you can see a big one and on top there’s a little one – yes, this is a picture from just this afternoon! Unfortunately, the only way to get rid of them is to pick them off by hand I was warned by a website that they ooze green slime when disturbed so I grabbed a glove and a plastic sack. About 25 worms later, I finished the job; boy, Brian sure has to be gone at the worst times! I sure could have used a guy right about then! In more cheerful news, the watermelon patch is amazing! 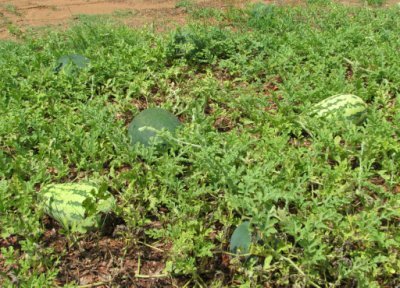 Over 20 watermelons and new ones each day! I think one is close to getting ripe. Notice the striped melons? I guess one of our plants wasn’t what we thought I can hardly wait to taste them!!! !